The Weighted Companion Cube (often referred to as the Companion Cube) is a recurring object and pseudo-character in the Portal universe. 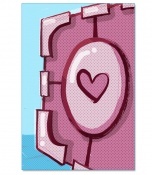 It appears almost identical to the Weighted Storage Cube but with a pink heart replacing the Aperture Science logo. 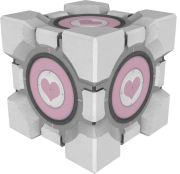 In Portal, the Companion Cube was given to Chell in order to aid her in completing Test Chamber 17. In order to progress through the exit at the end of the chamber, the cube was dropped into the incinerator to be "euthanized". GLaDOS used this moment to taunt Chell during their confrontation. However, the Companion Cube can be seen prior to the end credits next to the Cake, suggesting that it survived. The Companion Cube makes a prominent appearance in the Portal 2: Lab Rat comic, in which it speaks with protagonist Doug Rattmann. This appears to reference Portal, in which GLaDOS states that the Companion Cube cannot speak and, if it does, its advice should be disregarded. In Portal 2, GLaDOS briefly torments Chell by repeatedly destroying Companion Cubes in Test Chamber 7. It is at this point that GLaDOS claims that the Cubes are in fact sentient, which suggests that they possess some level or rudimentary intelligence similarly to Turrets. The Cube also makes an appearance in the Co-op campaign but is inaccessible, preventing the player from interacting with it. After Chell leaves the facility upon completing Portal 2, a scorched Companion Cube is ejected after her. 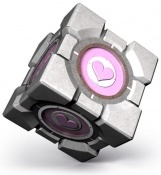 This Cube is not the newly-designed Portal 2 Companion Cube, but is the same as the cube from Portal. Valve said that it's the exact same cube the player euthanized in the first Portal, that is given back to her . Weighted Companion Cube in Portal. 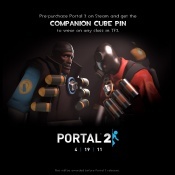 Companion Cube Pin promotional banner. The Companion Cube Pin backpack icon from Team Fortress 2. Companion Cube image from the official Aperture Science Collaborative Disposition Test. 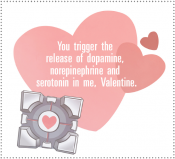 Companion Cube Valentine from Valve's official Portal 2 blog. Companion Cube icon from the official Steam Portal 2 group. Companion Cube as seen in Audiosurf in the [as-portal] mode. Companion Cube as seen in The Final Hours of Portal 2. Doug Rattmann's drawing of Companion Cube on a mousepad. A turret disguised as the Companion Cube. Companion Cube in the "Randolph the Red-Nosed Turret" comic. 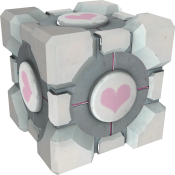 Players who pre-purchased Portal 2 through Steam received the Companion Cube Pin item, a pin item depicting the Companion Cube within a portal, for Team Fortress 2. Players who played all games in the Potato Sack Pack were awarded the Resurrection Associate Pin, which shares the same model. Additionally, one of the possible names for the AI bots in Offline Practice or enabled by a server is Companion Cube. The Companion Cube in Portal 2 hums an excerpt of Cara Mia, which can be heard when it is nearby. 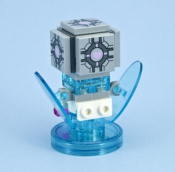 The Companion Cube appears alongside several other Portal 2 characters in the Portal 2 Level Pack for LEGO Dimensions. This page was last modified on 27 November 2016, at 20:33.